When you are looking for something a little different and breathtaking to brighten up your wedding reception decor, give us a call. We have numerous different styles of beautiful backdrops that will make your guests feel appreciated and overwhelmed with your design taste for your wedding. Call for Pricing. 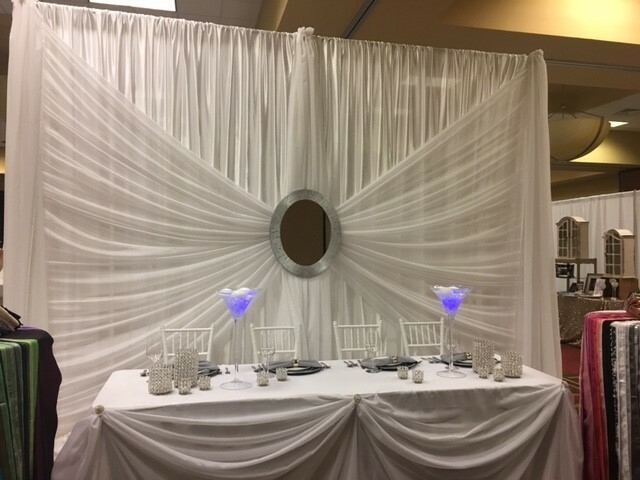 This particular design, we call the "Silver Mirror Backdrop" is 12' wide with soft elegant white sateen drapes for the back panel and white sheer drapes that meet together in the center to form the reverse "v" look. Each pole is covered with a white sheer drape as well and a Silver Mirror is hung in the center to provide an electric accent to the overall design. Needing a little wider design? The overall backdrop can be extended on both sides with a similar design - minus the Silver Mirror. Call for pricing. NOTE: These items cannot be shipped. Local setup only.